There is something magical about the first hut trip of the season. The glistening tranquil forests with boughs laden, the fragrance of pine, and pixie dust floating down and sparkling in beams of light. 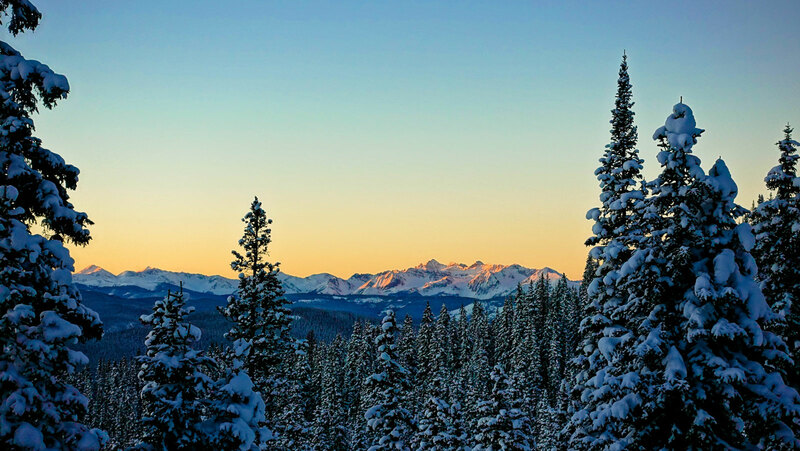 It’s the hiss of skis gliding through snow, the tinkle of shattered hoar frost, and the cold nip to the hands and feet that spills forth the feeling of winter. Before the early winter sun’s tepid and pale light spilled over the mountain tops, we briskly moved through the creek bottom. Our breath suspended ice crystals in the sub zero air. With a steady quiet rhythm, we broke trail in deep snow. Our legs pounded, strained beneath heavy packs loaded with gourmet food and libations. For hours and miles we climbed, leaning into the mountain. When we hit just over 11,000 feet, the ascent started to ease. The trees opened up and we caught the first scent of burning wood. It was the wisp of wood smoke floating through the pines that quickened my pace. Just a few minutes later we arrive at the hut. We clicked out of our skis, stomped the snow off our boots, opened the door, and dropped our packs to the old wooden floor. After pulling off jackets, emptying our packs, laying out sleeping bags and stowing our food, we dug into hut chores. 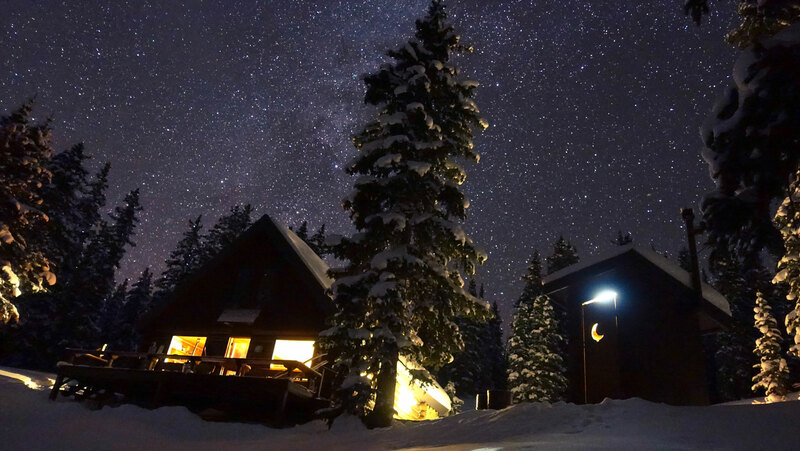 We gathered snow for water, shoveled the decks, turned on the propane, and stoked the fire. After chores and a brief rest we headed out for a late afternoon tour. We toured up to a high point with a panoramic vista where we gazed upon sweeping aretes, toothy ridges and stark majestic peaks etched into a bluebird sky. Our eyes smarted from the beauty of it , struck by the sublime clarity of the mountains in winter. As the sun quickly began to slide behind the western horizon and the temperature dropped like a rocket, we began our descent. We reveled in deep cold smoke powder turns through the long shadows of the late afternoon, hooting with joy, our cheeks frozen and stinging but creased with huge grins. We returned to the warmth of the hut just as the snowy peaks began to wash in pink alpenglow. Gathered around the fire at the onset of twilight – the first bright planets and stars twinkling in the sky – we listened to the crackle of wood, warmed our tired bodies, and relived the day. Cocktails and fondue were consumed as the night descended. Wood was chopped, snow was melted for water, card games were played, and the laughter was long and deep. I stepped outside one last time to fill the pails. The light of the rising moon touched the tree tops and cast long shadows onto the luminous snow. Still able to see the stars and planets in the inky night, I took it all in. Nestled at the edge of a meadow sits the hut, a beacon in the dark: warm, snug, and cozy. Skis stand at attention, glittered with frost. The sweet notes of a ukulele float up to the stars. I take a deep breath, drawing in the sweet scent of woodsmoke mingled with pine. Intoxicated by it all, I stand there, legs tired, soul awakened. 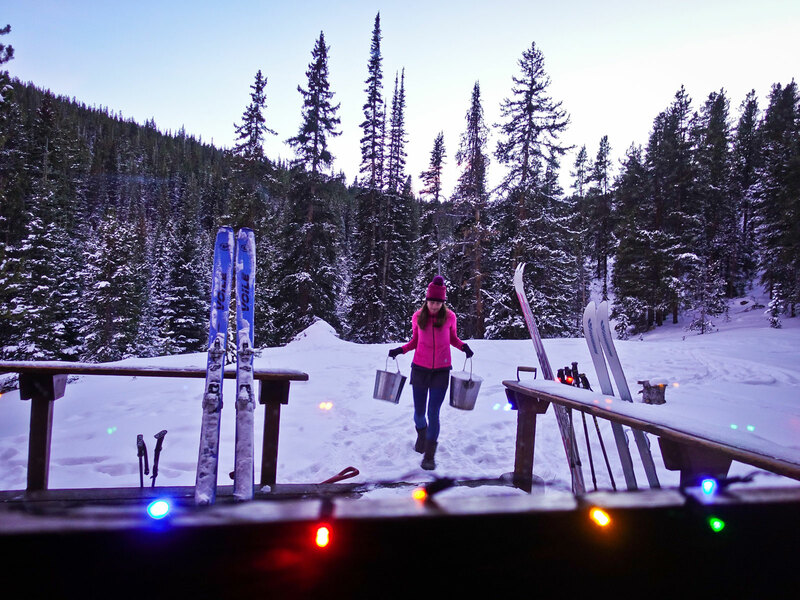 A Jill of all trades and a master at none, Ann is a weekend warrior and backcountry bon vivant who lives to hike, run, ride, paddle but mostly ski in the mountains of western Colorado. Ann lives in Carbondale, Colorado, from which she aims to explore as much of the wild and beautiful places of her local geography as possible. 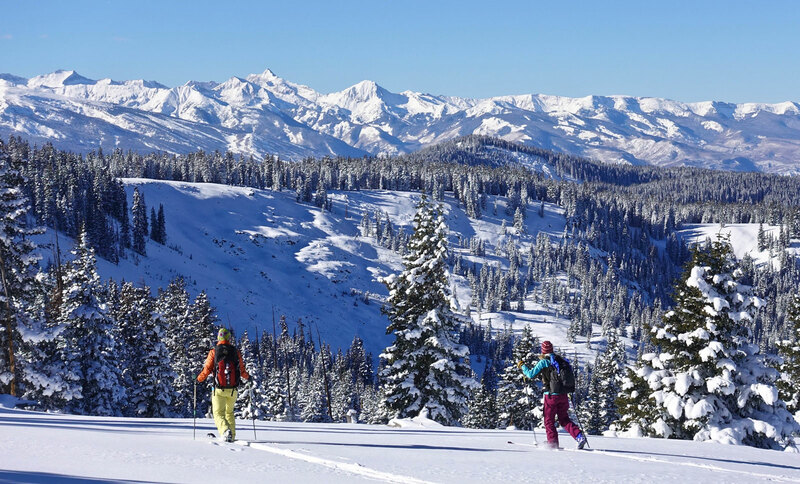 She loves to begin her day with a backcountry dawn patrol, watching the sunrise from a local summit and then sliding into work wiping the powder from her grinning face. The weekends are spent skiing deep into the Elk Mountains, where devising new routes and truly connecting with nature, returning with memories, pictures and words with which to inspire others, are what makes her tick.